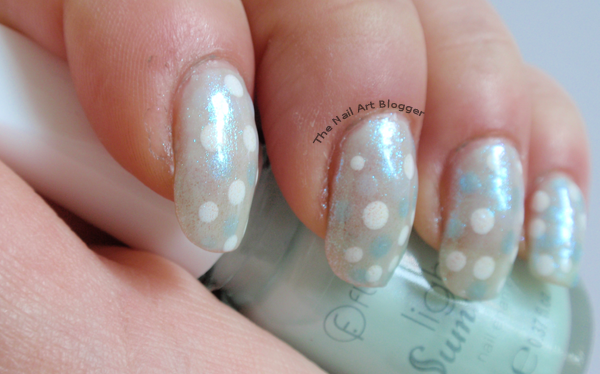 On the 10th of March I finally managed to do something for the Nail Polish Challenge group that I'm a member of. The day's theme was "What was your last polish purchased? ", and so I dug out the latest polishes that I bought. To my surprise (and a bit of pride at my self-control, as well) the last I had bought a new polish was in January when I went to Amsterdam to watch the NT Live production of Coriolanus (which was amazing, by the way). So while in Amsterdam, I wanted to go to Flormar, a cosmetics company that opened a branch in the city center not long ago. I've read about it from a few Dutch beauty bloggers, and I wanted to see it for myself. After keeping myself from drooling over their nail polish collection, I decided to pick up two colors -that I didn't already own- to test. 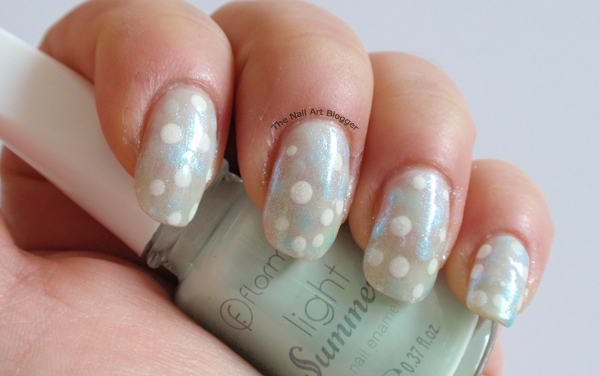 The polishes I got were LS05 (used as the base color here), and LS02 (used for the dots, which ended up being semi invisible lol) from the Light Summer collection. The polishes are very sheer. I used two coats of the LS05 for this mani, and I knew that I would get a complete cover with a third, but I decided against it. I had already used two thick layers and a third one would've been too much for my liking. Then I added dots using the LS02, and it just disappeared. I could barely see the dots. 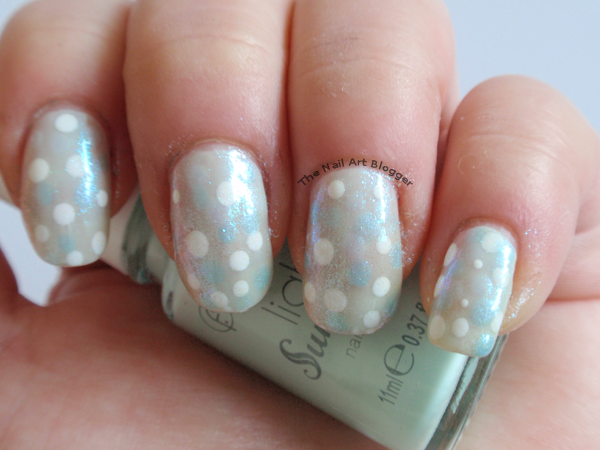 In the bottles, the polishes look very creamy. But then on the nails they are quite sheer, almost transparent, which was disheartening. Maybe I'll try to use thinner coats, and try to get it to a creamy finish. I like the colors too much to just let them just sit around. 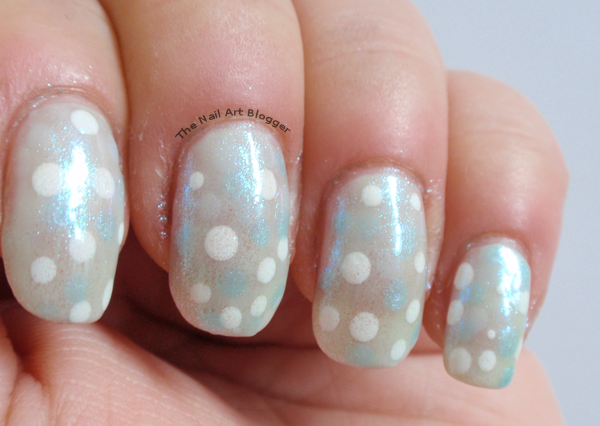 What I also did was adding white dots using #34 white by W7, and then some more random dots using the glossy color side of the #08 Blue Navy & Pearly Sky Blue from the Multi-Effect nail lacquer collection by Kiko (that's the blue that's almost showing on the nails). 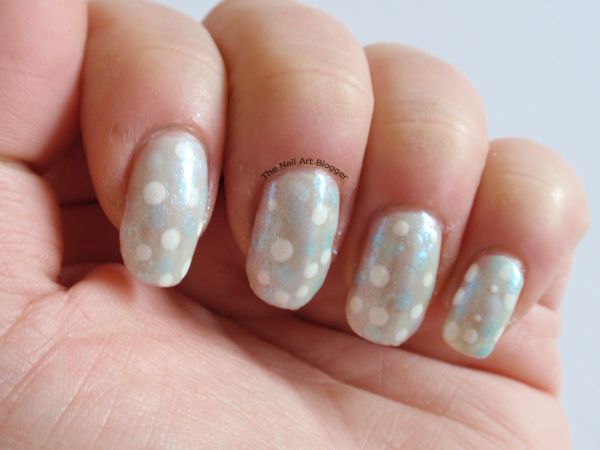 For a top coat I used the Diamond Strength No Chip Nail Polish #220 Crystal Beading by Sally Hansen. Overall I am pleased with the nail art itself. Random dots are fun to wear. My disappointment lies within the lack of coverage of the Flormar polishes. I'll simply use them in other forms of nail art. Maybe they would be good in water marbling. Another disappointment was the fact that I did this mani in the morning, and in the evening I discovered dents and the polish was still not completely dry at all, even though I waited long enough between coats so I could prevent them from denting or getting completely ruined. Alas, they were. So I had to remove the polishes completely. I think it was a combination of thick polish layers plus a slow drying top coat. One would think that it would dry within 12+ hours, but it didn't look like it. 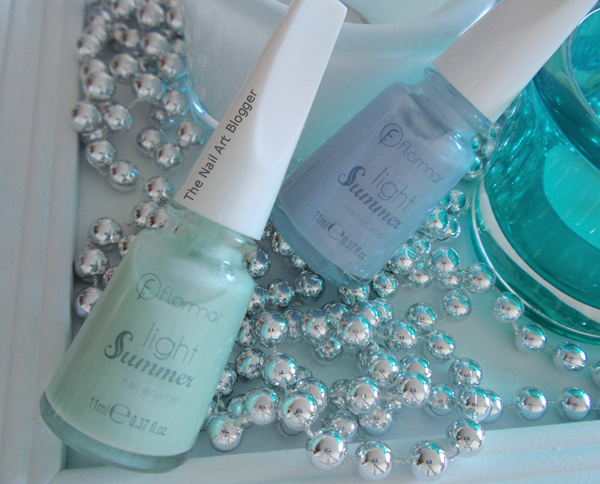 What's your opinion about Flormar polishes?